Did you know the Craftsy's Summer Supplies Clearance is happening NOW? Shop and enjoy up to 75% off yarn, fabric and project kits before they sell out. Take advantage of some of the biggest savings of the year! Hurry, offer expires Monday, July 28 at Midnight (USA Mountain Time). 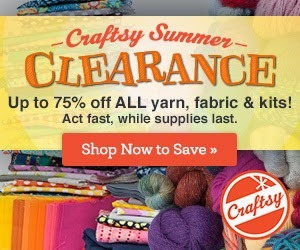 Shop the Craftsy's Summer Supplies Clearance now to save!